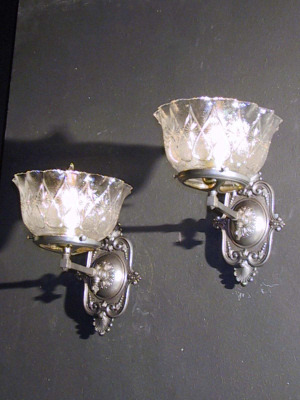 Circa 1905, this sweet straight arm Gas Sconce has a fan design on the gas key. The Pressed Glass shades with heart loop details and star burst design are a nice compliment. The back plate has a fan motif on the top and the bottom with a floret center. A swirl border adds to the presence. 9"length x 7"width x 10 1/4"from wall. Found a home in a Double Parlor in Cambridge, MA.